A genuine light ashen-blue 6mm cushion-cut antique-square aquamarine gemstone is bezel-set into a high-polished sterling silver women's ring that has been rhodium plated for extra brightness, sheen and longevity. Band measures 2.25mm wide and head width of the ring is 6.5mm in size. Sterling silver is .925 purity, the highest available for silver. 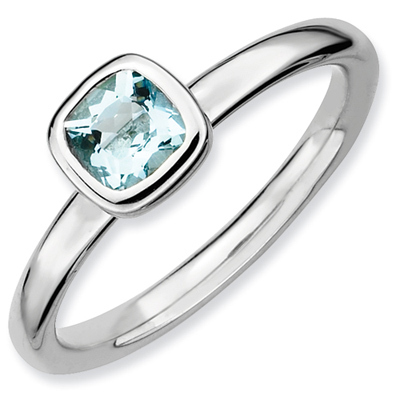 Great as a stand-alone aquamarine gemstone ring and also the perfect size to be used as a stackable ring. We guarantee our Cushion-Cut Aquamarine Bezel-Set Polished Gemstone Ring in Sterling Silver to be high quality, authentic jewelry, as described above.